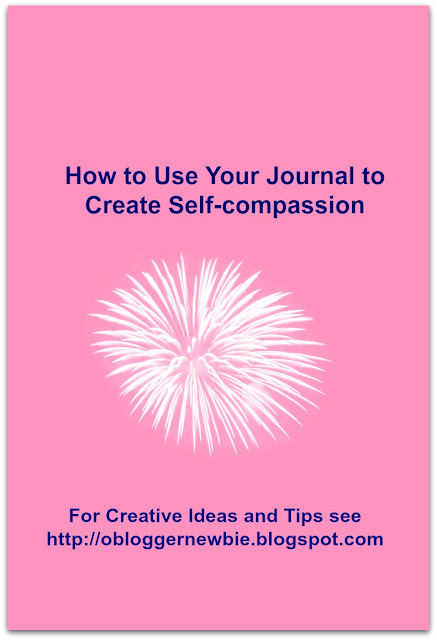 Keeping a daily journal to process the difficult events of your day through a lens of self-compassion, helps reduce stress, develops self-awareness, and stimulates insights about how you treat, think, and feel about yourself. When you make journal writing a daily self-care habit, just like brushing your teeth and wearing clean clothes, it can lift a gloomy mood, bring personal growth, and refresh your spirit. You don't need to write a blow by blow description of every event of the day. Take five or ten minutes to jot down a brief description of what were the high points and troublesome moments of your day. Journal writing can help you be more patient and honest with yourself. It sheds light on those emotions that come into play, when you have a knee jerk reaction, as well as times when you've felt less than. You know, those times on the job or with relatives or friends, when you compare your insides and your situation to other people’s outsides. I've discovered that each time I repeat this old, ineffective pattern, I'm setting myself up for self-esteem disaster. Ask yourself whether you agree or disagree and why. Read-4-Powerful-Reasons-Why-Journal-Writing-is-Good-for-the-Soul. 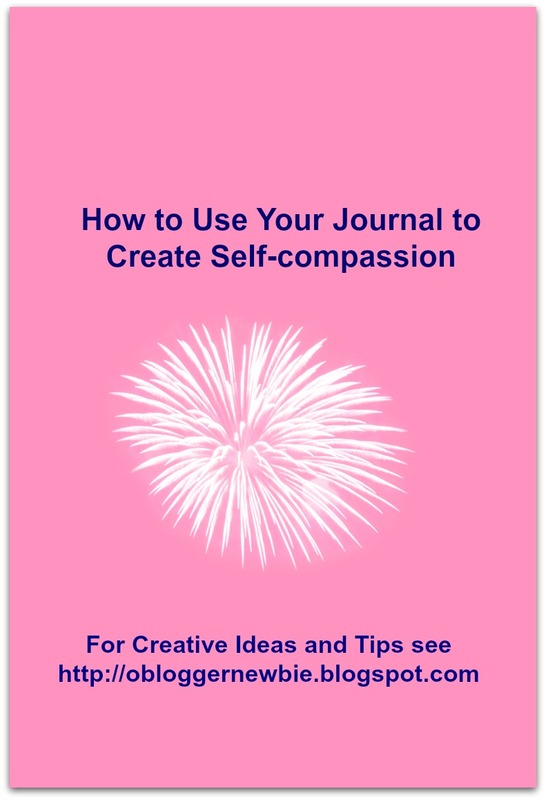 Your journal can become a dedicated place to improve your relationship with yourself. Revealing your true feelings about who you think or feel you are, what you want, and your concerns, requires trust in the self-exploration process. If you're nervous about this, my suggestion is to "act as if you do trust the process." For any challenging event, emotionally wrought experience, or area of distress you experience during the week, try to recall and write down exactly how you felt. Getting this stuff out of your mind, body, and spirit can help you put some distance from the situation and look at it in a new light. Use space in your journal to record any change or forward movement you've made since the last time you experienced something similar. 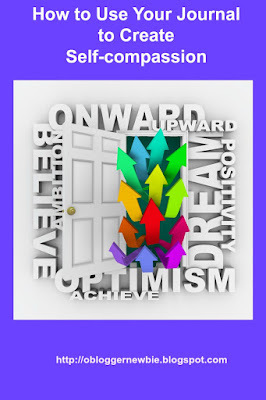 If you don't notice any forward motion, assure yourself you're doing the best you can. That's a perfect example of self-compassion. It helps to identify and connect with your humanness and vulnerabilities. Get in touch with your motive or motives for acting the way you did, and you'll see it's your responsibility to care for yourself and get those needs meet in a healthy way. For me, most often I act impulsively when I have a desire to be liked, accepted, considered, valued, and praised. Those are all things I need to give myself. Journal writing is a simple way to figure this out. 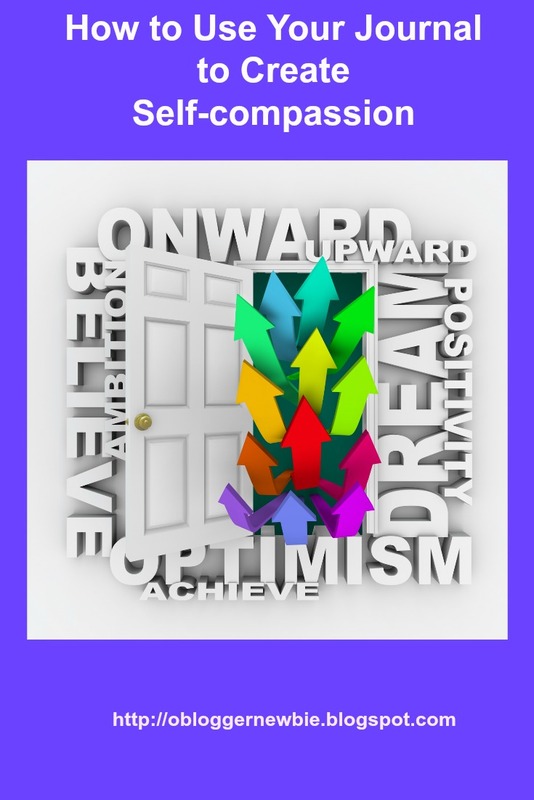 When you've tried everything I've suggested and still feel stuck, you have an opportunity to reach out to and get help from emotionally mature, available people in your life. Pick someone who's a good listener and will help you sort things through. Then, write down every kind thing you can remember about the incident. One example is to thank yourself for not shouting at the other person or calling them names. If you've overstepped a boundary and did react badly instead of responding appropriately, think about a way to make an amend to that person. Do it as soon as you can, to clean up your side of the street! Self-care-Activities-to-Encourage-Optimal-Health. Next, try to notice if something about the situation triggered an event or experience from the past. One way to check whether this is happening is to identify whether you feel extremely vulnerable and immature, like a duck out of water. See 5-steps-for-managing-your-emotional-triggers for more help. Another way to identify feelings from the past, is to evaluate if emotions are intense. When your emotions get hot and heavy, it usually means what happened in the present reminds your subconscious that in the past something bad or hurtful happened to you. It "sets off" or "triggers" old or frightening recollections, and you feel panic and out of kilter. I know from past experience that when someone is unkind or rude and I'm hungry, lonely, tired, and off-center, it’s a challenge to brush it off or express my displeasure in a kind, direct way. I usually get tongue tied and regress to old behaviors of silently blaming, judging, and criticizing others instead of saying how I want and need to be treated. Straying from this path of self-care and self-expression makes me feel creepy. Can you relate? If you keep on repeating the same ineffective coping skills or patterns, give yourself permission to consider seeking professional help. Journal writing gives me the ability to own uncomfortable residual feelings on paper, whenever I still feel bad about an interpersonal or personal issue. I reflect and determine if I am judging myself too harshly, or holding on to guilt, shame, anger, sadness, or hurt. I make it a point to care and comfort myself like I would do for a child. That means I shower myself with love, acceptance, and forgiveness. Read 6-ways-to-shower-yourself-with-kindness for more tips. It's important to observe the stories you write about yourself and others and what issues you struggle with. 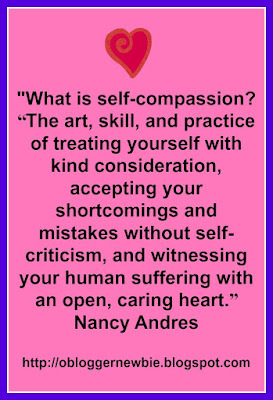 When you love and have compassion for yourself, it can transform your life, one event, day, and experience at a time. For many additional tips and guided journal activities that help you create greater self-compassion order Colors of Joy: A Woman's Guide for Self-Discovery, Balance, and Bliss. It makes a colorful gift to give yourself. 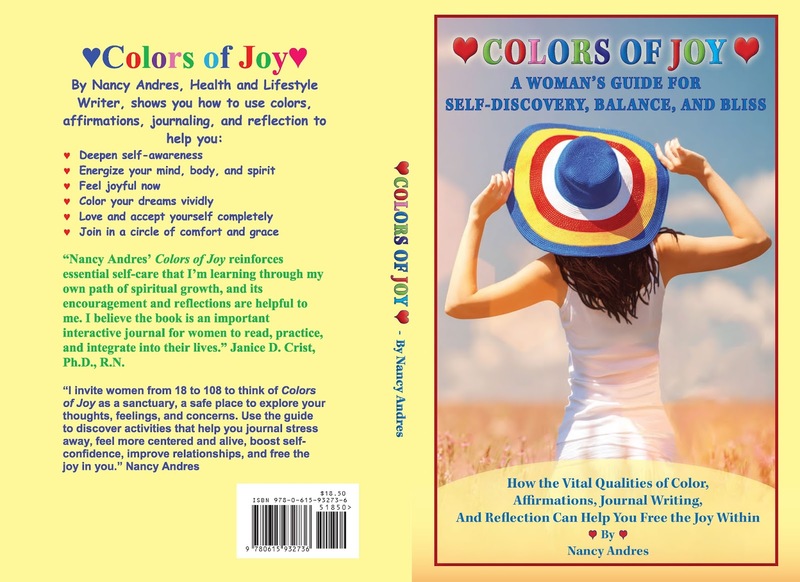 Colors of Joy is also a delightful way for you to show a loved one you are thinking of them. If you prefer, Purchase it at Amazon Books. Before you go please take a moment to comment and share if you like what you see. 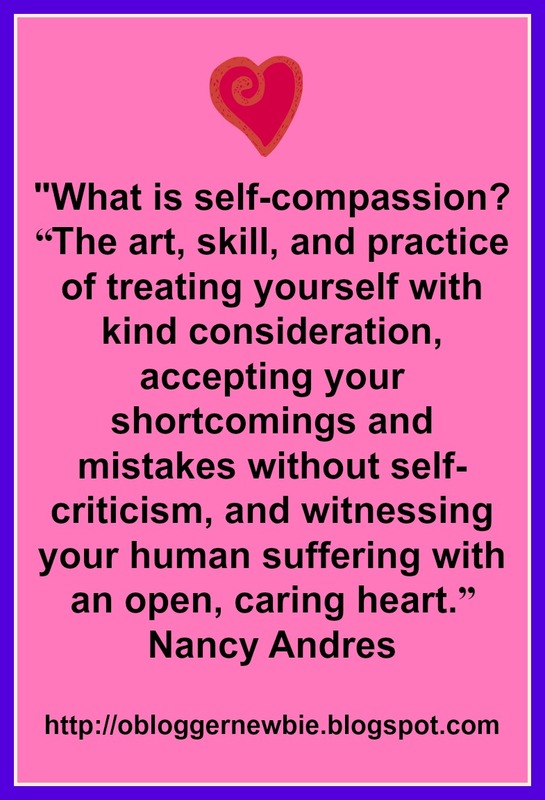 Remember to practice self-compassion for as long as it takes this attitude and behavior to become a habit. And then keep on practicing. Thanks for visiting and please come back again. This post has been shared at NO RULES WEEKEND BLOG PARTY #238! Very insightful article. I thin most of us tend to self judge ourselves harshly and we all want acceptances. I have tried journaling and it can be helpful by helping organize your thoughts and put them into perspective. Life can be overwhelming at times and I know that I don't always put my feelings and emotions in proper perspective and think clearly. When I write it down it can help me see thing in a different? Thank you for sharing your thought and excellent advice. Pinning & tweeting. Have a healthy, happy & blessed day. Thanks Marla for your comment and support. Please remember to affirm your goodnes, becuase you have plenty of that. 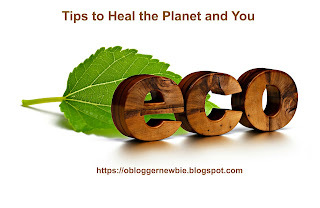 Since I already commenting I'll just congratulations on being featured on HHG&N blog hop. Thanks for saying reminding me to affirm the goodness if myself. Thanks Marla. Nice to hear from you. Wishing you a blessed day. What a great post. I have never tried journaling , but it does make sense to take the time to write out your feelings. Lately , I have found myself repeating some old ineffective coping patterns. Maybe this is what I need .. thank you so much!